From the Content Area you want to add content to click Build Content > xpLor Content. Enter your search query in the search bar. Click Discover from the xpLor home page. 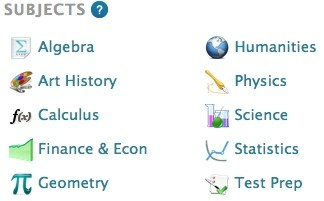 Click on any of the ten available subjects. From the list of resources click the title to view the resource. Click the Add button to add the content to your course. NOTE: The content will be added to the content area from which you launched xpLor from. To change the destination click the arrow next to the add button and click Add to Course(s). From here choose your destination folder. Add: Adds the content to your content area. Add to Course(s): Add content to multiple courses and change the content destination folder. Add to Channel(s): Add content to multiple channels. Add to Favorites: Adds the content to your favorites. Download as Common Cartridge: Creates a downloadable common cartridge. Generate Launch URL: Creates a launch URL to use in an External Tool or LTI item. About: Displays a short description (if available), rating and additional metadata. Version info: Displays the content creator, copyright license, usage information, and version history. More Settings: Edit the content. Instructors can duplicate the resource to adjust the description or to enable a discussion. 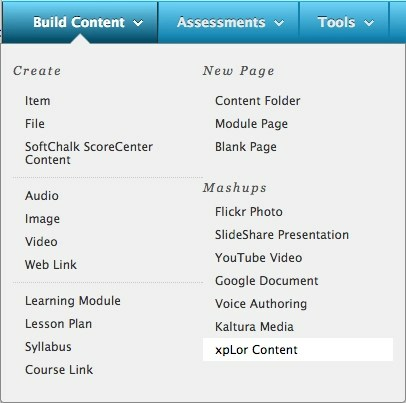 Upcoming posts will feature how to upload content and how to filter content in xpLor.